One thing about me and my friends is, we like being really unique, A question I got from a friend was, What kinda Snapchat are you using? My response was a smile. That takes me to the real deal. Best Apps like SnapChat. Snapchat is really fun and cool for those who have been using it. But here, I am going to unleash cool Android apps that are like SnapChat and can fill in the shoes of Snapchat. Just in case you don’t have enough space on your Android device or you’re bored of haven to use Snapchat all the time, to spice things up a bit, you can download and use any of the apps that I will introduce to you below that can help you take those crazy photos and you won’t even miss the real Snapchat. Now, the best part of it, you will have more features to enjoy, try, learn and share. If you are already enjoying SnapChat as we do, then having some more apps like SnapChat will be a good leap. We will be picking the alternatives based on Snapchat augmented reality features and message self-destructive features. Let’s go! Instagram is a popular social media app that is as close to Snapchat. This app was one of the first camera social network app that allows you to send images and videos that expires and clears off. It also has a similar feature with Snapchat, that is the story feature. The story feature allows you to post an image or video and auto deletes it after 24 hours. There are also some bonus features like the story feature and the Instagram television features. Also, this app has a built-in camera that lets you take pictures with filter, stickers, and effects. It also has a photo editor, that lets you edit your images before posting them. This app is one of the best apps like snapchat and also a very good social media app on its own. We recommend you to give this app a shot and see what it looks like. It might even beat Snapchat at it, you can never know. Face swap is another best app like snapchat, that is similar to the augmented reality of Snapchat. This app allows you to take a picture of yourself and lets you implant it on another person’s face in a picture. You can also change your clothes with this app too. This app doesn’t need you to keep opening you right like a dog to apply an effect but it is very smart in detecting a human face. Well from my findings, I can say that this app has made it much easier to put your face somewhere else and this app is not available for some locations. We must confess, this app is not as much fun as you think, but it’s one of the best apps like Snapchat. Any person reading this post must have heard about Facebook to be one of the most popular social media app with many features. Well, it is related to Snapchat in some aspects like The story feature which is called Facebook story. Facebook story feature just works like snapchat, you get to post a photo or videos and watch them expire after 24 hours. This app can also be used to edit photos and share them with your loved ones and friends. It also has an in-built camera app that allows you take pictures and apply an effect and use stickers too. This app is a little bit kind of old fashioned to use but it’s preety cool. It is one of the best apps like snapchat that is more easier to use 😉. Google allo app is the latest messaging/social media app, that is developed by Google. If you are in search of an app that is protected with your pieces of information and has the message self-destruct feature just like Snapchat then Google Allo is here. This app has an incognito mode feature that keeps your chats private by clearing them within a space of time. Google Allo has no camera features neither does it have the augmented reality feature. This app functions alot more like whatsapp but it similar to snapchat. It’s only similar to Snapchat because of its self-message destruction features. The size of this app varies with certain Android devices, so have enough Data on your Android device when trying to install. When it comes to apps like this I’ll just sit back and enjoy the ride. The amazing stickers and features available in this app makes it unique and in a way a whole lot more fun than most of the apps on my list of Best Apps Like Snapchat. It completely blows my mind when I see the things that this app can do. Bitmoji is one of the most fun interactive Snapchat alternatives that are out there on google play store and other Android app stores. Just like Snapchat, you can take shots with friends, and when I say, friends, I mean more than two or three friends, provided they can all enter the camera’s range. You can also use Bitmoji in your Snapchat app and even other chatting platforms available on your Android device. You have an enormous bank of stickers that you can choose from to beautify your pictures and add color to your day. If you’re tired of the emojis and stickers that Bitmoji has to offer, you can also create a cartoon avatar, just featuring you. Another excellent and well-crafted app is here, Yubo is a cool chatting social app, where you get to meet new friends, send and receive amazing pictures and cool stickers. Use the swipe features to add new friends to your new social app, swipe right to see friends then add or you can swipe left to ignore and pass. In Yubo, you can not only chat in a group format, but you can also chat one-on-one with a special friend in your very own private conversation room. You can also go live through live chat and other means. There are millions of viewers out there, so Livestream your pictures and videos for the public if you choose to. more than 15 million people around the world have signed up with this app, so what are you waiting for, sign up now! and join the fun. Trust me when I tell you this I did save the best for last. My article will be incomplete without one of the most popular, entertaining, effective and highly interactive apps like Snapchat out there in the world today. Now Whatsapp might not have the best filters or the best lenses when taking snapshots in the app, but the app is totally worth it. With Whatsapp, you can chat in a group chat, in a private conversation chat room, share pictures and videos privately and for the public, only for those that have your Whatsapp number and are added to your Whatsapp, but even with those that you don’t chat with, they can still view your pictures and videos through the public status update, but the good thing is that you can block them if you choose to. Fun stickers, cool emojis, you name it, Whatsapp has them all, even with the new and improve Whatsapp stickers now available on Android app stores, you can spice up your chat and share with fun amazingly outstanding stickers that you thought never existed. 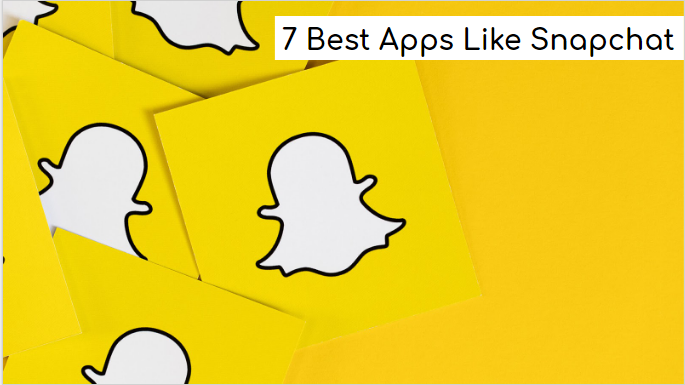 When it comes to the Best Apps Like Snapchat out there, you can only but find a handful of apps that can match up to and reach the expectations of Snapchat. This article is about Snapchat apps alternatives, so all the apps that I have listed above can work in that dimension. The size of some of the apps above may vary in some Android devices, so whatever size you get to download, it doesn’t matter, do so and enjoy the roller coaster ride with the apps after. For your benefit and fun, you can have more than one of the Snapchat apps alternatives listed above, already, I’m sure most Android users have Instagram and Facebook at the same time installed in the same Android device. So you can do so also. I also want to take this time to thank you very much, it is always my pleasure being here to help you with your tech-related problems, till next time, bye.